The planning stage for a trip around Australia requires a whole lot of decisions to be made. 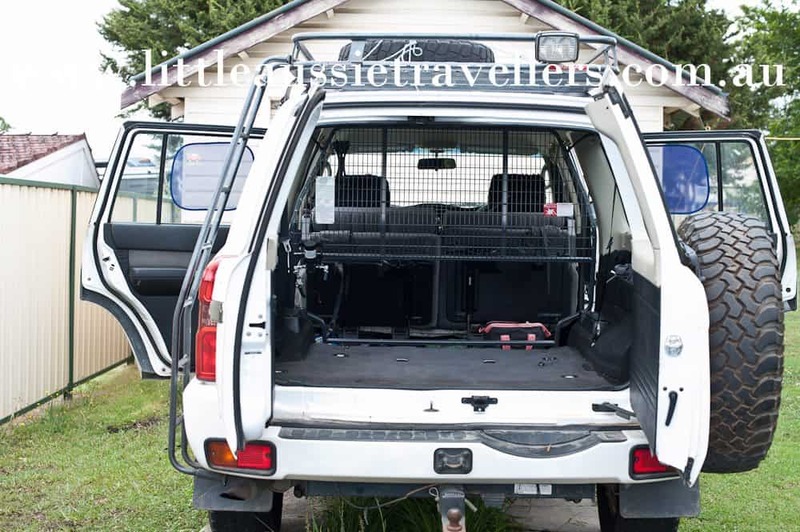 We’ve written before about how to choose the best car to travel Australia and we wrote this basic guide to planning a big lap of Australia for those who weren’t sure where to start, so now, we thought it was time to share with you some of the choices and modifications we’ve done, starting with our vehicle. 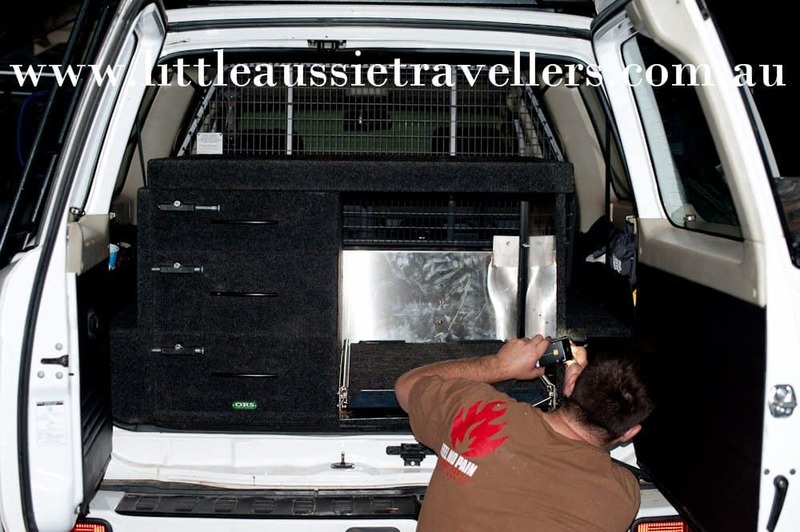 We chose to travel in a Nissan Patrol. A big reason for this was the space and the off road ability, as well as the dual fuel tanks and tow capacity. We knew before we purchased our car, that one of our ideal modifications was to fit a rear drawer system. There are many options on the market for rear drawers, with everything for just fitting a basic fridge slide, to systems that contain water tanks, fridge slides and drawers. We went with the latter. Weight is a really important factor: Regardless of the specific weight specifications of your vehicle, the more weight you add, the bigger you can expect your fuel bill to be, and fuel is one of the biggest expenses of touring the country, so anything that keeps the cost down is a bonus. Aluminium units are ideal, some use wood, and that’s ok too, you just need to think about what it is you’re purchasing. 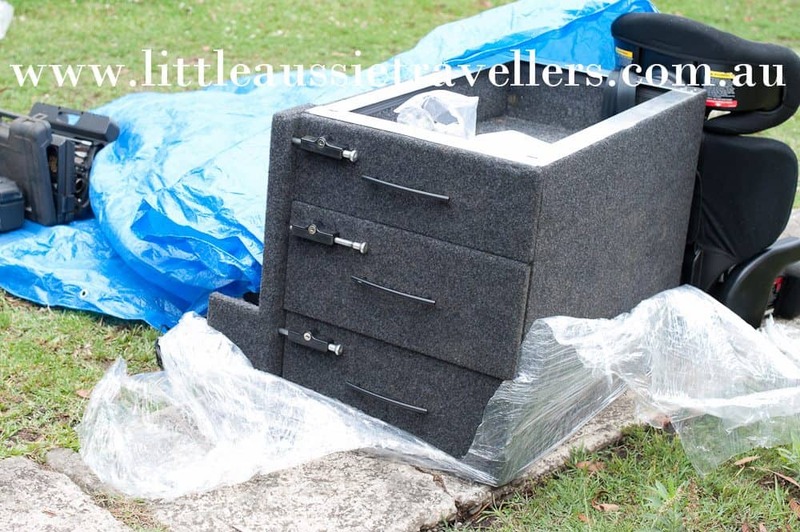 Self install vs professional install: Some brands give you the option to deliver the product flat packed and you then do all the assembly and fit out yourself. 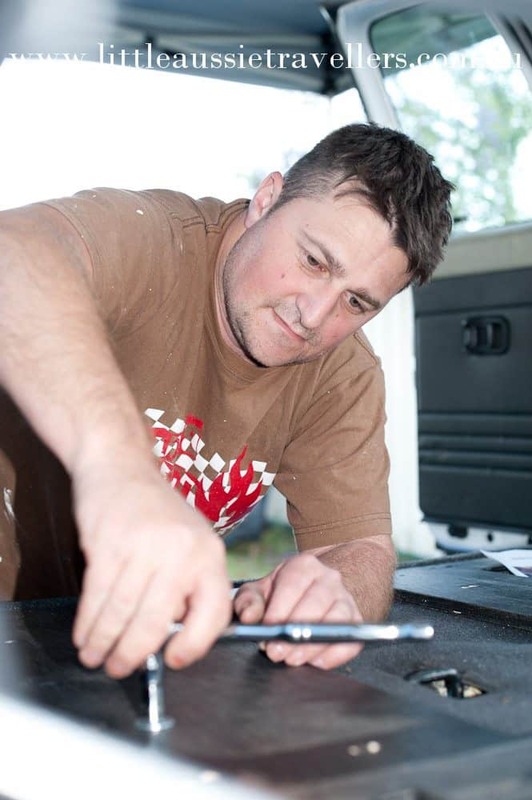 If you’re handy with the tools this can be a good way to go, and save you some money. Keep in mind the extra time and your skillset and weigh up these options. Your vehicle type: Depending on your vehicle, you’ll have a range of options available to you. We had several options for the Patrol, although some less popular models may have less options available. For a basic fridge slide, most cars will be able to have this feature installed. Second Hand Purchasing: We scored a bargain when we purchased our fit out. 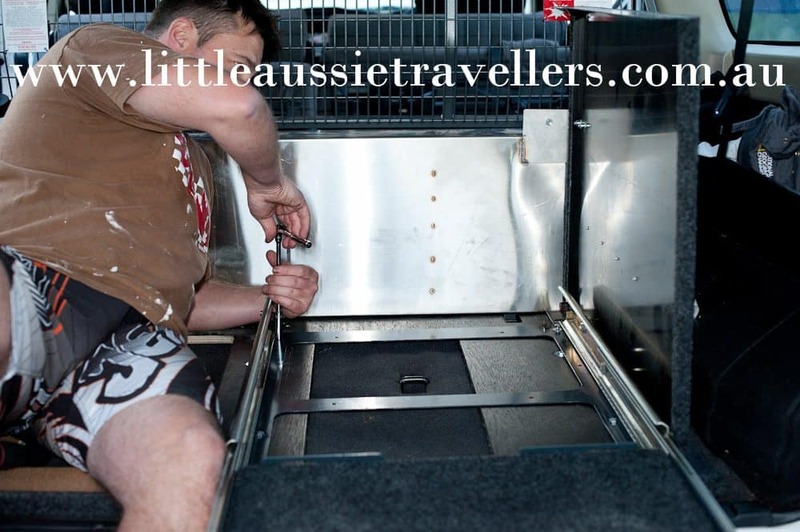 We have a triple drawer system with fridge slide, and a 60 litre water tank with 12 volt pump, and a half cargo barrier so we can load it up and things won’t go flying into the front of the car. I believe it would have cost close to $3000 installed. We picked it up for $1900 from ebay and it was in perfect condition. $80 delivery fee from QLD to our door, and a few hours install and it’s one of the best choices we’ve made. 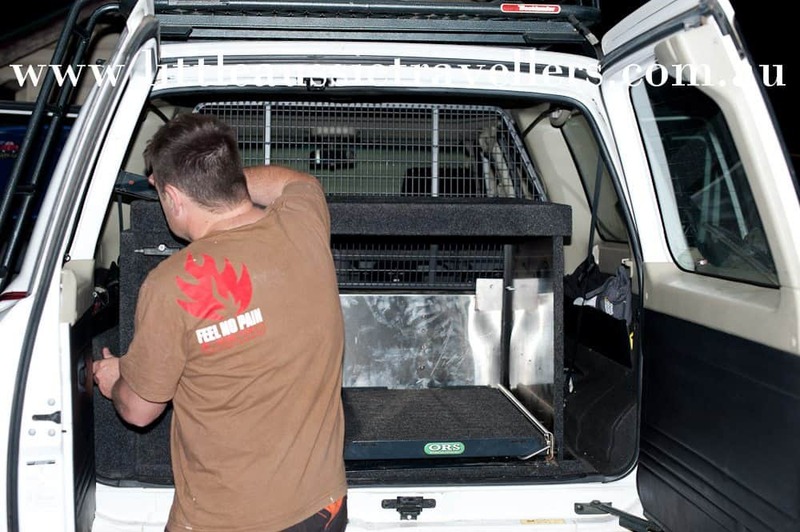 Here’s our guide to the Nissan Patrol, rear drawer system and water tank install. Our rear drawer and water tank system – It arrived wrapped in plastic complete with instructions. Rain was approaching and it was afternoon when it arrived, but we figured it wouldn’t take too long so we layed it all out with a tarp on hand just in case and went about installing it. First Step: Remove the rear seats for the Patrol, then install the half cargo barrier. Second Step: Was to install the water tank which is the silver you’ll see in the next photo after this one. Then install the bottom plate and attach to the floor of the car where the seats normally anchor. The drawers are then built up on top of this. Up Next: Install the sides and the fridge slide components. And we’re done! By this time we’d put a gazebo up to protect us from a few showers, and it was super dark and we were working by torch light, but even though we underestimated the time it would take, it was a relatively easy job and the finished product looks great. Great job with the drawer install. Looks pretty simple to install,just wanted some idea of the level of competency required to do this ? Was there any need to drill or were you able to use existing anchor points ? The drawer system came ready to be installed into a GU Patrol so all we had to do was use the existing anchor points by removing the existing anchors and securing into the ready available holes. It’s a bit of a jigsaw but if you’re clever enough to put together flat pack furniture, you’d be ok putting in a drawer system. Its all accurately cut to fit in where it needs to go. Hope that helps. Nice work mate. If you are handy with tools, you can build a set similar to what you have got, but it does take quite a few hours to do it properly. I like the fact that the fridge sits on the ‘floor’ as a pose to on top of a drawer. Never understood the point of that!